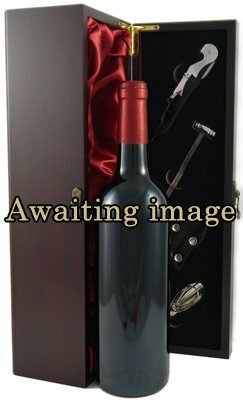 This Bordeaux red wine is shipped in a silk lined wooden presentation box with four wine accessories (corkscrew, wine pourer, drip stopper & wine thermometer) [worth £17.99] at no extra cost. One Only. This product is in stock and available for immediate delivery. We use UK Mail to deliver your wine gifts in the UK. A signature from someone over 18 is needed for proof of age as this is a licensed product. We cannot leave goods in a safe place for proof of age as this is a licensed product. We offer a next day delivery service costing £6.99 per order. Orders must be received by 1630 to go out on this service. We also offer a Saturday before noon service costing £19.99 and an all day Saturday service costing £12.99. Orders over £39.99 that do not require next day delivery, will be shipped free of charge within five working days or on any date of your choice. Orders under £39.98 will incur a £5.99 delivery charge. We can ship same day to areas in Greater London and the South of England. Please phone 020 8746 7771 for a quote. Our couriers deliver Monday to Friday 0800 - 1830, excluding bank holidays. Please enter a delivery address that will have someone available to receive the gift between these times. You will receive an e mail confirming that the order has been shipped and another when the order has been received stating when it was delivered and who signed for it. We are the largest online retailer of vintage wine gifts by treating you, our customer, as we would like to be treated when we shop online. We have a phone number (020 8746 7771) where you can talk to someone based in the UK about any of our wines or any issues you have. We promise to answer all emails within 90 minutes during working hours with most be answered almost immediately. We promise that you cannot buy our wines cheaper anywhere else and offer a money back guarantee. We offer a no quibble refund policy if for any reason you want to return your unopened purchase. We offer a replacement policy if your wine is corked. We also communicate with you by acknowledging your order immediately, emailing you when it is despatched along with tracking information and also emailing you when the gift has been successfully delivered.